Those wanting to experience the engaging dynamics and retro-inspired design of the Mini Cooper but also have the need for some practicality may be interested in the 4-door Hardtop variants. For 2017 the addition of previously optional equipment as standard and some new trim choices complete the changes to the lineup. The 4-door Cooper offers the same dashboard and interior trim as the rest of the range and the well bolstered front seats have enough adjustment to fit even taller adults. There are a lot of soft-touch plastics and high-quality materials about, a step up from the usual interiors in this class, and shoppers can pick from a variety of inlays and fabrics too. The center armrest tends to get in the way of the touchscreen controller but this is a narrow car and rivals are no better in this regard. The two extra doors and extended wheelbase add slightly to the rear passenger space and available cargo area. This is still a small car but the added practicality is welcome. The 4-door hardtop retains that sharp handling feel inherent in the rest of the Mini range and its slightly extended wheelbase tends to imbue it with a better ride quality than the smaller 2-door. Braking and turning is still excellent and the cabin is well insulated from outside noise making for a decent highway cruiser if required. When it comes to a twisty road the Mini really comes into its own and the limited-slip differential helps keep the front wheels from scrabbling too much on corner exits, aided in this case too by the more modest power output on offer compared to the more sporting models in the range. The Cooper Hardtop is equipped with a turbocharged 1.5-liter 3-cylinder engine that produces 134 horsepower and 162 lb-ft of torque. Either a standard 6-speed manual or optional 6-speed automatic transmission sends the power to the front wheels through an electronically controlled limited-slip differential. Identical performance figures are claimed for both transmissions. The claimed 7.7-second 0-60 mph time is a little off the 2-door Hardtop thanks to an additional 125lb it has to carry around but it is still very competitive for the class and the Cooper feels responsive and quick in everyday driving. The 4-door Cooper comes in one trim level with a range of available packages and stand-alone options to pick from. Standard equipment includes a 6.5-inch touchscreen with smartphone and Bluetooth integration, climate control, split-folding rear seats, cruise control, auto headlights and wipers as well as a limited-slip differential and 15-inch alloy wheels. A range of packages are on offer, the Technology Package includes a parking assistant, navigation system and real-time traffic information, the Sport Package offers upgraded wheels, sport seats, LED headlights and dynamic damper control. While the Premium Package includes a panoramic sunroof, Harman/Kardon audio system and comfort access. Or you could just tick the Fully Loaded Package box which bundles the whole lot together. There is one additional Cold Weather Package which offers heated front seats and auto dimming power exterior mirrors. Then there are a whole host of interior and exterior design options to further customize your Mini such as JCW interior and exterior packages as well as a new Mini Seven Edition Package and Signature Line which all offer exclusive design elements. 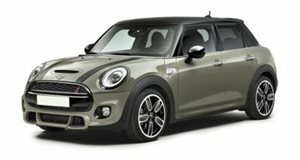 While the Mini Cooper 4-door is no mid-sized family car, the extended wheelbase and addition of the rear doors makes it a more viable prospect for smaller families. It adds a level of practicality that extends its reach beyond its 2-door stablemates. A comprehensive range of available upmarket features such as dynamic damper control and comfort access as well as a range of customizable options make this a premium subcompact offering with a difference.